As China moves from an export-fuelled economy to one that relies on domestic consumption, Wilton Park’s 1000th conference looks at how China’s industrial development can become more sustainable. The conference, held in the run-up to the international climate change conference on 7-18 December 2009 in Copenhagen, will bring together policy makers, academics and business people from China, the UK, US and Europe to discuss how climate change can be raised on the agenda for China’s political and business leaders. They will analyse how to develop media and public diplomacy strategies and how to set in place mechanisms for continued engagement on these issues that will lead to real progress in the future. According to an online survey, 62 percent of Chinese and 63 percent of Indians agreed developing countries like China and India should cut carbon emission just as developed countries do. LONDON - Most Chinese and Indian people agree developed countries have the right to demand that emerging countries cut their carbon emissions, according to a survey by market research firm Global Market Insite. Eighteen percent of the 14,188 respondents polled in 14 countries for this year’s World Environment Review said US government policy was the biggest threat to the world’s climate. This included 13 percent of US citizens and 23 percent of people from European G8 member countries France, Germany, Italy and Britain. Only 14 percent of those asked said they thought lack of action by developing countries to reduce their emissions was the biggest threat to the world’s climate. And less than 12 percent of Chinese and Indians surveyed said US policy was the biggest threat to the environment. BEIJING (AP) - A Chinese city has halted construction of a chemical plant after residents sent more than 1 million mobile phone text messages protesting possible pollution dangers, news reports said Thursday. The $1.4 billion facility being built by Tenglong Aromatic PX (Xiamen) Co. Ltd to produce the petrochemical paraxylene was planned for the booming southeastern port of Xiamen, the Xinhua News Agency and newspapers said. “The city government has listened to the opinions expressed and has decided, after careful deliberation, that the project must be re-evaluated,” a deputy mayor, Ding Guoyan, was quoted as saying. The plant was to be located 10 miles from the center of Xiamen, a center for Taiwanese and Hong Kong investment. The nearest homes were about a mile away, according to news reports. The U.S. Environmental Protection Agency has launched a new consolidated Chinese-language Web site as part of its ongoing effort to provide environmental information in English, Spanish and Chinese. 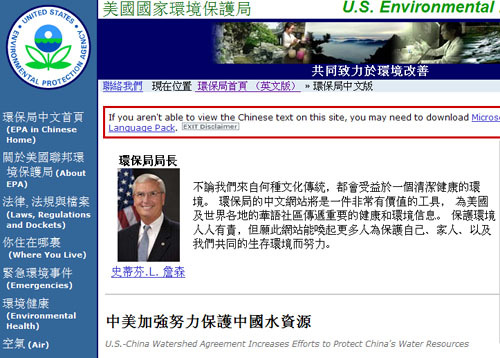 The new site compiles EPA Chinese-language materials on a wide variety of issues from lead poisoning prevention, energy efficiency, and clean water to proper management of pesticides. At the moment most of the contents are in Traditional Chinese (繁体中文), but EPA promises more contents in Simplified Chinese (简体中文) will be added soon. The site also serves as a valuable tool in delivering important health and environmental information to the Chinese-speaking community, both here in the U.S. and worldwide, to help protect local communities as well as the global environment.